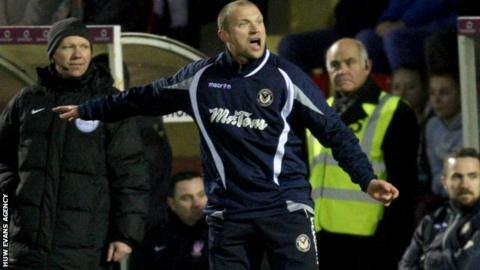 Newport County boss Warren Feeney believes the Rodney Parade ground staff are doing all they can to avoid a fixture pile-up. The Exiles, currently 20th in League Two, share their home with both Newport RFC and Newport Gwent Dragons. County have had three postponements since December while ex-boss John Sheridan criticised the ground staff. "They face very difficult circumstances with the three teams playing and do a good job," Feeney told BBC Wales Sport. "I wouldn't tell them how to do their job anymore than they would tell me to do mine. Feeney said he was delighted to sign striker Dean Morgan, a former team-mate of Feeney's at Luton. "He's got two good feet and a big mouth," Feeney joked. "He's got loads of experience and I feel like we need that." Feeney has taken an unnamed Irish player on trial. "We may look to do that deal next week," Feeney said. He is also considering his options regarding loan players, saying: "We have a full complement of six, so I will talk with my staff on who we look to extend the deals for." Loanees Connor Dymond, Ben Davies and Mitchell Beeney all see their loans expire after the weekend visit of Carlisle. Feeney was less than impressed with the Carlisle contest being given a 13:00 GMT kick-off to avoid clashing with the Wales v Scotland Six Nations contest. "I'm a rugby league man," he joked.